What has the life of a Jewish photographer in post-WWII Brazil got to do with a Viennese student of the 1930s? In Kurt Klagsbrunn’s case, it’s the same person. The Jewish Museum in Vienna has a small exhibition in his honour. Born in 1918, Kurt Klagsbrunn was a Viennese student looking forward to a career in medicine. At least that was the plan until the rise of national socialism. He fled Vienna in 1938 to build a new life as a professional photographer in Brazil. Klagsbrunn’s photos form a historical record of Brazilian life, fashion, social change, and industrial development, his shots documenting everything from high-society parties to construction projects…capturing everyone from the rich and famous to the simple shoe polisher. His work appeared in numerous publications, including Time magazine. The exhibition itself deals with the two worlds inhabited by Klagsbrunn – a youthful Brazil and 1930s Austria in the grip of fascism. Photos from the Klagsbrunn collection, focusing on his adopted country, seem to exude a kind of joyfulness and lightness of being that you don’t find in the displayed items from late 1930s Vienna. There is nothing overtly dramatic or notable in those items from Klagsbrunn’s Viennese life until you look closer. They seem almost weighed down by history. The banality of a tennis club membership card contrasts with the implied discrimination of a military document confirming his Jewish status. An innocent-looking emigration form includes the question, “Aryan or non-Aryan?”. It only takes a few minutes to explore the room, but the harsh contrast between Brazilian optimism and the darker days of Austria is quite powerful. P.S. Be sure to check the beautiful ceiling in the exhibition room, too . The Klagsbrunn exhibition fills a room on the first floor of the main building of the Jewish Museum. You don’t need a special ticket, just a normal entrance ticket for the museum, which can also be bought online*. The museum is included in the Vienna Pass tourist card. The exhibition runs from Wednesday, December 5, 2018 to Sunday, May 19th, 2019. 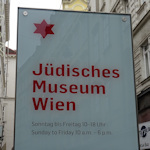 See suggestions on the main page for the Jewish Museum.